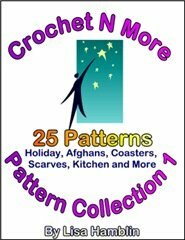 With over 700 crochet patterns you are sure to find what you are looking for. doilies, home decor, speical occassions, tatting and wearable patterns. There is something for everyone for every occassion. 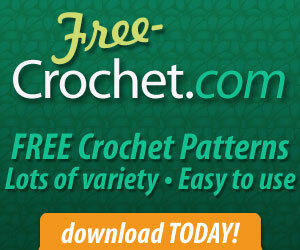 Download your favorites today at Free-Crochet.com! Shopping for a plus size dress? sizes 14 to 44 in stock and ready to ship. Discover styles that fit and flatter every figure! College, Music, Holiday, Animal, Bratz, Nascar, Looney Tunes & SpongeBob. 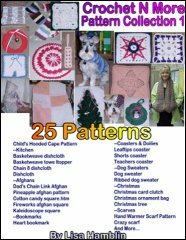 Now offers 2,713 Free Knitting, Crochet and Yarncraft patterns! to songs from that year. The link goes to 1997 which was the year my daughter was born. "Don't ask God to guide your footsteps if you're not willing to move your feet." "For this reason I say to you, do not be anxious for your life, as to what you shall eat, or what you shall drink; nor for your body, as to what you shall put on. Is not life more than food, and tthe body than clothing? Look at the birds of the air, that they do not sow, neither do they reap, nor gather into barns, and yet your heavenly Father feeds them. Are you not worth much more than they? And which of you by being anxious can add a single cubit to his life's span? And why are you anxious about clothing? Observe how the lilies of the field grow; they do not toil nor do they spin, yet I say to you that even Solomon in all his glory did not clothe himself like one of these. But if God so arrays the grass of the field, which is alive today and tomorrow is thrown into the furnace, will He not much more do so for you, O men of little faith? Do not be anxious then, saying, 'What shall we eat?' or 'What shall we drink?' or 'With what shall we clothe ourselves?' For all these things the Gentiles eagerly seek; for your heavenly Father knows that you need all these things. But seek first His kingdom and His righteousness; and all these things shall be added to you. Therefore do not worry about tomorrow, for tomorrow will worry about itself. Each day has enough trouble of its own." Be on guard, that your hearts may not be weighted down with dissipation and drunkenness and the worries of life, and that day come on you suddenly like a trap; for it will come upon all those who dwell on the face of all the earth. You younger men, likewise, be subject to your elders; and all of you, clothe yourselves with humility toward one another, for God is opposed to the proud, but gives grace to the humble. Humble yourselves, therefore, under the mighty hand of God, that He may exalt you at the proper time, casting all your anxiety upon Him, because He cares for you. Be of sober spirit, be on the alert. Your adversary, the devil, prowls about like a roaring lion, seeking someone to devour. But resist him, firm in your faith, knowing that the same experiences of suffering are being accomplished by your brethren who are in the world. And after you have suffered for a little while, the God of all grace, who called you to His eternal glory in Christ, will Himself perfect, confirm, strengthen and establish you. NEVER INTENDED US TO BEAR." Who was the son of Omri? Removed the reference to "sl st" from the stitches used and added information about crocheting into the "hump" of the chain. You can find a wealth of information on Tunisian Crochet online. 70. Im not sure if this idea is listed, but i use my scrap yarn to embroider faces on toys, like eyes and mouth! do you have number 71? It could be a tension problem. Maybe you just crochet tighter than I do. If that's the case all you need to do is make your booties with a larger hook size. The first four rows of the bootie are all single crochet stitches. Then Rows 5 begins the shaping. Row 8 makes the little holes for the ribbon to be woven through. Row 9 is just to decorate the edge. When you finish Row 9... you have joined the top of the bootie with R8 and R9... but the heel and bottom of the bootie need to be sewed up. You turn the bootie inside out... sew it up and then turn it back right side out. Weave in your ribbon tie and make another one. I love this pattern but cannot reconcile the photo with the directions. The photo shows 2 rows of puff stitch, but the directions only describe one row (#18). Am I misreading it? Thanks. Thanks... I'm glad you like it. There's only one row of puff stitches (R18). The post stitches on Rows 20 & 21 make the edge textured.
" a distinctive and recurring form, shape, figure, etc., in a design, as in a painting or on wallpaper." Crocheted granny squares are considered "motifs". The term motif can be used to refer to any crocheted shape that is used repeatedly in a pattern. I have questions regarding several Table Runner stitches. 1) The first row is: R1: Ch40, dc in the hump of the 4th ch from the hook. Dc in the hump of ea rem ch. (38 dc). The directions mention to dc in the hump of the 4th chain from hook. What is a "hump" stitch? 2) The pattern indicates the follow stitches: ch, sl st, dc. 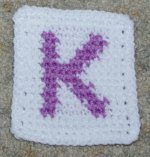 In reading the crochet directions, there is no mention to do a "st st". I use a previous pattern as a template for new patterns and failed to remove the reference to the slip stitch in the table runner pattern. I really appreciate you letting me know. NOTE: The "hump" of the chain is the back ridge of the chain stitch. When working into the chain you can either insert your hook under the top strand of each chain (the method most people use) or into the back ridge, "the hump", of each chain. Working into the "hump" of each chain makes a very nice edge on the foundation row. Thank you for your patterns. We have a crochet group associated with our church sewing ministry. We are currently making booties for Buckner's International's "Shoes for Souls" This is a new project from Buckner's. Our first donation was 40 pair of booties for an orphanage in the Honduras. Our most recent goal is 100 booties. Your patterns have helped me tremendously. I would like to have permission to share your patterns with our ladies. Many of them do not have computers so it would be very helpful if I could share. You're very welcome Dora. I do realize that many people still do not have access to a computer. Therefore, you have my permission to print multiple copies of my patterns for your ministry. Please print and distribute the pattern(s) "as is". Please note that not all patterns on my website are my designs. Thank you for using my patterns for your charity and I wish you much success is attaining your 100 booties goal! LOVE YOUR SITE. ESPECIALLY THE CHRISTIAN CROCHETS AND CRAFTS. HOPE TO LEARN TO MAKE BOOKMARK CROSSES FOR EVERYONE IN MY SUNDAY SCHOOL CLASS. I'm crocheting your pattern and have tried and tried to get past round 4 but cannot because I don't understand the terms there. SC in b1 only - what does this mean? Sc dec, in back loops only over next two sts.? What does dec mean? I know what the back loops are. Does this mean decrease. like crochet 2 stitches together ? Sc in bl only means you work the single crochet only into the back loop of the stitch. This is the loop farthest away from you. Dec is decrease...yes, there you single crochet 2 stitches together. Thank you so much for writing. I have looked over the basics page and removed the links that were broken. Hopefully I got them all. It sure seems there were alot of them this time. Some webmasters fail to realize that renaming and/or moving pages that others care enough to link to causes them to lose traffic to their site(s). I don't link to the main index page of the sites I list because alot of people have problems navigating sites to find the information. 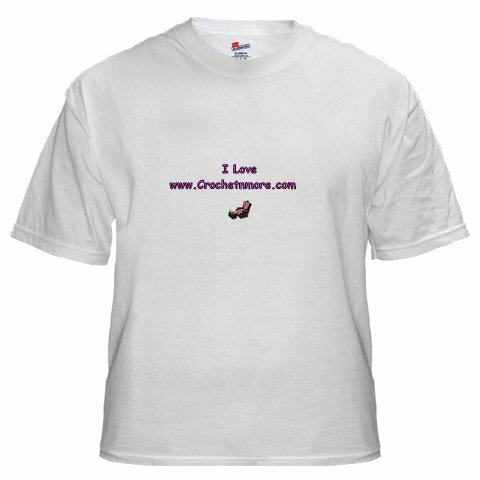 Anyway, thank you very much for taking the time from your schedule to help me better the Crochet N More website. I am going to try and make your Puff Stitch booties and hat and a puff stitch blanket. The only thing missing is the sweater. Would you have instructions for an easy puff stitch sweater for a new born? I have a puff stitch baby sweater on my design list for a future pattern. Not sure when I will have that particular pattern available though. Until then... you can always add a row of puff stitches to your favorite baby sweater pattern. I hope you enjoy the other patterns. Subject: Could you please help me to understand this crochet pattern? Would you mind helping me to understand this crochet pattern? For example, in Row 1, do I skip chain 1 to chain 5, and just do a double stich at chain 6? Since there are only 10 chains, that would mean I am only doing 1 double stich for Row 1? As you can see, I am quite a beginner at this. I haven't really crocheted before. Row 1- 1 dc in 6th ch from hook, [1ch, skip 1ch, 1 dc in next ch] to end. Row 2- 1 sc in first dc, 2ch, 1dc in first sp,[1ch, 1dc in next sp] to end, 1dc in 4th ch. Row 3- 1 sc in first dc, 3ch, 1dc in first sp,[1ch, 1dc in next sp] to end, 1dc in 2nd ch. Thank you so much for taking your time to put this into simple English for me. along with the unabbreviated version of these instructions following it. This means you make 10 chains or 54 chains depending on which size you are making. >>Row 1- 1 dc in 6th ch from hook, [1ch, skip 1ch, 1 dc in next ch] to end. For Row 1 you work one double crochet stitch in the 6th chain from the hook. [Now chain 1, skip one chain and work one double crochet in the next chain.] Keep doing this until the row is finished. >>Row 2- 1 sc in first dc, 2ch, 1dc in first sp,[1ch, 1dc in next sp] to end, 1dc in 4th ch. For Row 2 you work one single crochet in the first double crochet. normally you make one chain to turn a row that begins with a single crochet. [Chain 1 and work one double crochet in the next space] Keep doing this across to the end. Work one double crochet in the fourth chain of the foundation row. >>Row 3- 1 sc in first dc, 3ch, 1dc in first sp,[1ch, 1dc in next sp] to end, 1dc in 2nd ch. For Row 3 you work one single crochet in the first double crochet. Again... there's no reference about chaining 1. [chain 1, work one double crochet in the next space] Keep doing this across to the end. Work one double crochet in the second chain of the previous row. My Etsy sales are used to make angels for Angels For Hope. Approximate cost $2.00/angel for supplies/postage. Angels are free for anyone that request them from the AFH website.
" I Love www.Crochetnmore.com "
We were proud that no one had fallen out on our company's first long hike. Completely exhausted, we sprawled on our bunks, too tired to move -- except for one private. He showered and was ready to go out on the town. Why wasn't he knocked out like the rest of us, we asked. "You know the truck that was with us in case anyone fell out?" he replied. "Well, somebody had to drive it." Isn't it strange that lemon juice is made with artificial flavor but dishwashing liquid is made with real lemons? "Can people predict the future with cards?" asked the Sunday school teacher. "My mother can," said Sally. "Really?" responded the teacher. "Yes. She takes one look at my report card and tells me what will happen when my father gets home." Mother: "Soooo... you want to become my son-in-law." Suitor: "No, but I don't see any other way to marry your daughter." Knowing nothing about that particular condition, she double- checked with Doctor Mike Wilson. After listening to the tape, he shook his head. "This man," he said, translating for her, "has fallen from a tree." 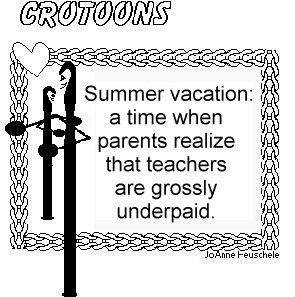 Sounds travels slowly… Sometimes the things you say when your kids are teenagers don’t reach them till they’re in their 40’s. A three-year-old in the congregation regularly watched football games with his father. So much so, that he knew some of the signals the referee makes. the child interrupted the service by jumping up and shouting, "Touchdown!" A listener called the disc jockey on the air at our radio station to ask about the upcoming lunar eclipse. "The eclipse can be seen at 1:30 in the morning," the DJ told her. "Why can't they schedule these things earlier so kids can enjoy them too?" Hey did you know that my airplane got caught in a heavy storm. The winds were horrific and then the engine started leaking. Then it is a miracle that you landed safely on the ground and nothing happened to you. Who said the airplane was flying?!! The young couple invited their elderly pastor for Sunday dinner. While they were in the kitchen preparing the meal, the minister asked their son what they were having. "Goat," the little boy replied. "I heard Dad say to Mom, 'Today is just as good as any to have the old goat for dinner.'" While camping in the mountains one day, I came across a gorgeous gorge that I thought was an echo canyon. But the response sounded to me like, "Hello where?" I tried again. "How do you do?" A moment later, the report came back sounding like, "How do I do what?" Baffled and amused, I decided to give it the ultimate test. "You're not really an echo canyon, are you?" The response from the big ditch confirmed my suspicions. "Brilliant deduction, Einstein."